Finding ways to stay warm throughout the winter without excess expenditures can be fairly difficult, especially if you’re still using an oil-fired furnace to heat your home. Many new home heating alternatives are much more effective, efficient, and environmentally friendly than oil. At the forefront of this new shift in home heating is propane gas. Oil furnaces typically produce heat at about 60% efficiency, meaning that for every dollar you spend on heating oil, you’ll only get about 60 cents worth of heat. Propane gas furnaces, on the other hand, are much more efficient, with ratings typically 90% or above. Do you have an older home with an oil tank? Many insurance companies place strict rules on how old oil tanks and furnaces must be in order to be covered by your household insurance policy. This means that you may have to replace your oil furnace equipment before it shows signs of wear and tear. Oil leaks are also very difficult to clean up, and can cost thousands of dollars. 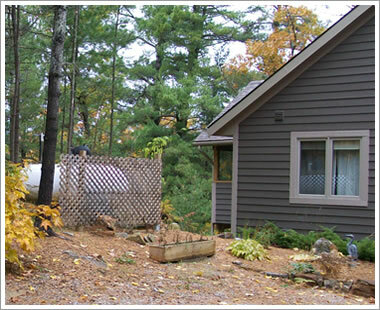 Propane heating equipment is much more affordable, and has no long-term effects on the environment during a spill. The Insurance Bureau of Canada (IBC) paid out $78.5 million for oil tank spills between 2008-2011. The main cause of the oil tank fractures were; corrosion, piping and overfill. IBC recommends, "For safety’s sake, it is necessary to take some precautions to avoid an oil spill. Otherwise, serious environmental and financial consequences could result." • One litre of leaked oil can contaminate 1 million litres of drinking water. • A pinhole in your tank can empty 1,000 litres of oil. • Cleanup of an oil spill can involve everything from replacing the tank and supply lines and removing contaminated soil, to replacing your home’s foundation. Finally, propane is much better for the environment. It is clean-burning and produces far fewer emissions than oil. Burning of fuels, from coal to wood, heating oil, gasoline and natural gas, produce various kinds of carbon that contribute to global warming as greenhouse gases. 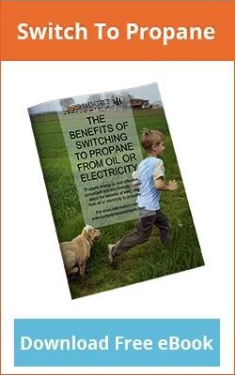 • Propane has a lower carbon content than fuel oil, gasoline, diesel, kerosene and ethanol. • Propane gas contains significantly less greenhouse gas emissions per productivity unit compared to other fuels. 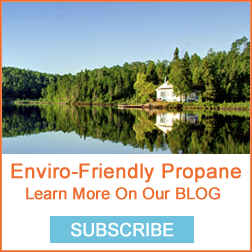 • Propane has a tiny carbon footprint and is highly efficient. Propane can play a major role in fighting climate change by offering homeowners a safe, reliable, and affordable alternative to burning oil. Budget Propane Corp. is a leading supplier of propane fuel across Central Ontario, Including: Huntsville, Parry Sound, Orillia, Bala, Bracebridge, Gravenhurst, Midland, Barrie, Alliston, Orangeville, Uxbridge and all the communities in between.